The hotel is quite spectacular - towering ceilings, marble and gold everywhere. It was our first indication of the general design and architecture of the public buildings in Dubai. Even the giant malls are marble, glass and gold, with boutiques featuring all the big names in fashion, design, shoes, jewelery. The words that were evoked for me were lavish, luxurious, sumptuous, opulent ... and after a while excessive and over--rich. 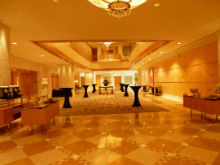 The staff were polite and eager to please although we ran into some confusion with the room assignments that took some sorting out. 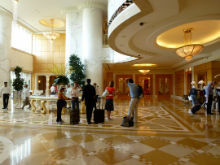 We decided as a group to hire a van and a guide to drive us around for the afternoon and give us a overview of Dubai. The guide was scheduled to pick us up at 2 PM so we dispersed to get unpacked and organized and some of us arranged to meet for lunch. 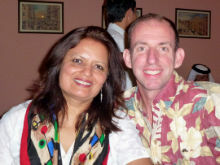 I was sharing a room with Anne, the Australian guest who had joined the cruise in Singapore. 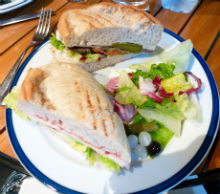 The two of us headed down the the lobby cafe, Panini's for lunch. We both ordered paninis - which turned out to be very good. I had the roast beef with remoulade sauce on whole wheat bread. After lunch we all waited in the foyer . Our guide who arrived promptly at 2 PM was a delightful knowledgeable person who provided us with a good idea of how the city was laid out and what more there was to see. 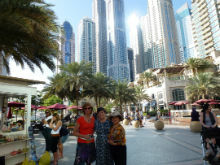 Here is what I wrote as an introduction to Dubai on D for Dubai in the 2012 A to Z Blogging Challenge. "Dubai is one of the 7 emirates that constitute the United Arab Emirates, on the Arabian Peninsula. The 7 Emirates, each governed by a hereditary emir are Abu Dhabi (the capital of the UAE), Ajman, Dubai, Fujairah, Ras al Khaimah, Sharjah and Umm al-Quwain. Dubai, also known as the Golden City, is one of the fastest growing cities in the world, with modern skyscrapers, soaring from a desert land. 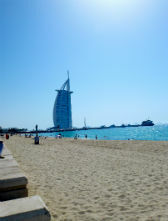 It is a city of contrasts from the old city al Bastikiya area, where wind towers provide the "air-conditioning" to the modern luxury of the Burj al Arab Hotel. The Palm Jumeira area where the world's largest three man-made islands have been created, seems to be a "don't miss" area. Other areas of interest are the Gold Souk, the Jumeirah Mosque - stunning modern Islamic architecture and the Sheik Zayed Road, the "Manhattan" of Dubai." That was written in anticipation of my visit. 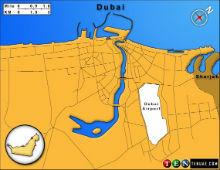 The two maps, the one on the left from the UAE information site and the other from Google maps, shows how The Creek divides the city into two areas. You can also see two of the artificial islands, made from sand dredged in the process of deepening the coastal waters. We saw the Palm Jumeirah, the only one of the three planned communities that is built up as of now, and walked through the Atlantis. This is what we got to see on the first day tour. We started off our tour at the Jumeirah Mosque where we stopped for a look but did not go in and ended it at the Dubai Mall, where we had dinner at Wafi Gourmet, a restaurant serving traditional Lebanese food. We ate at the Wafi restaurant adjacent to the Dubai Fountain. In between we visited the public beach at Jumeirah, the Souk Madinat Jumeirah, and more mega-malls than you can possibly imagine. We saw the indoor ski hill, the Aquarium and water park and the famous Dubai Fountain. The fountain is huge, with jets shooting 900 feet into the air in sequences choreographed to classical and contemporary Arabic and world music. By the time we got back to the hotel that evening after dinner I was quite tired and my head was buzzing with impressions of the city. The immense quantity of towering buildings, the huge lavish mega-malls, the miles of sandy beaches - all jumbled together to create a superficial sense of immense wealth and luxury, and a sophisticated, more liberal society than I had expected from a Middle Eastern country. I realize that this is a very superficial view of the city. One can hardly expect to get more than a snapshpt (literally) on a brief visit. The economy of Dubai was badly hit with the world recession, and required major assistance from Abu Dhabi. Many projects on the drawing board have remained there - only one of the three planned palm islands has been built. And while the large population of ex-pats seem to be relatively unrestricted in day to day life, they are still visitors no matter how long they have lived and worked there. As to the cuisine, I enjoyed my Lebanese meal and looked forward to sampling the many varieties of Middle Eastern foods that are available in the restaurants of Dubai and Abu Dhabi. 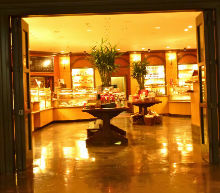 My restaurant visits will appear with pictures and comments in Dubai and Abu Dhabi: A Culinary Exploration. Part I and Part II.